Airline profiles now feature weekly capacity, frequency, ASK/ASM (Available Seat Kilometers/Miles) with Top 10 airports served by capacity/frequency, Top 10 routes by weekly capacity, frequency and ASK/ASM. Drilldowns allow you to easily look at the data on a route or airport level. Airport profiles now feature weekly capacity, frequency, ASK/ASM (Available Seat Kilometers/Miles) with Top 10 airlines serving the airport by capacity/frequency, Top 10 routes by weekly capacity, frequency and ASK/ASM. Drilldowns allow you to easily look at the data on a route or airline level. Latest Arrival: Aircraft Quick Search! 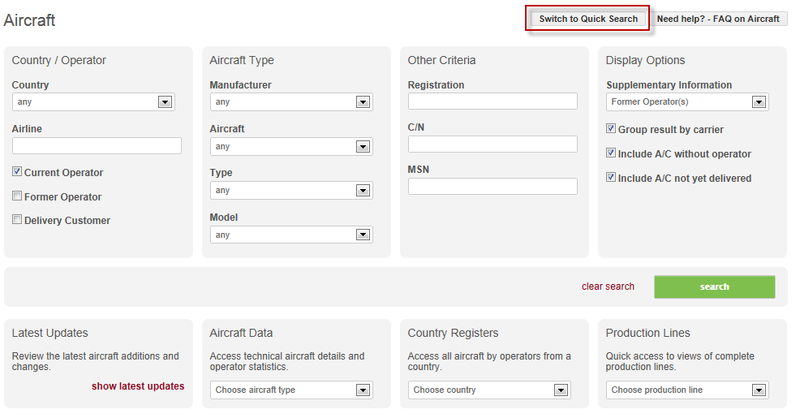 We have now added a new aircraft search option for you if you are just looking for an aircraft by registration, airline or aircraft type quickly giving you access to aircraft details even quicker than before. As of right now, you can use our new Quick Search function that will by default be the standard search form for all visitors who have not yet subscribed. Then just click on the search button and your results will display immediately. To learn more about the extensive search options and additional details available to ch-aviation and ch-aviation subscribers, click here. https://blog.ch-aviation.com/wp-content/uploads/2012/12/quick-search-3.png 480 990 Thomas Jaeger https://chaviationblog.wpengine.com/wp-content/uploads/2017/01/ch-aviation_blog.png Thomas Jaeger2012-12-04 10:56:422017-02-03 09:28:43Latest Arrival: Aircraft Quick Search! Starting off with the addition of 556 DC-8s to our growing database of Aircraft tracked by ch-aviation, we are embarking on a couple of weeks of continous enhancements to our Aircraft module (that we will update you about as and when they are made available). We now have slightly over 37,500 aircraft being tracked in our database with weekly updates to hundreds of database records with the Tupolev Tu-134 and several regional aircraft being next on the list of new types to be added to our fleet lists. We would like to welcome you to our new site and help you making you feel at home with our new look and feel as well as a lot of new and exciting features and functions. We have completely revamped ch-aviation as an airline knowledge base and have adjusted our strategy behind each of the modules based on that. As you start exploring the site, we have also provided some additional help by adding some assistance in the FAQ sections you will find to be helpful for each of the six modules (News, Aircraft, Airlines, Airports, Routes and Schedules). You will find the links in the upper right hand corner of your screens. We have revised our News strategy and will now provide several weekly news updates covering global airline industry developments with a focus on strategic network and fleet developments, airline start-ups and bankruptcies as well as mergers, acquisitions and strategic partnerships. The news are now also available in a weekly ch-aviation Newsletter as well as through our new RSS feed. There will also be a Weekly Airline Route Network Update tracking network changes of over 700 airlines worldwide and available to our ch-aviation pro users both online and in the weekly newsletter. You can actively get involved and discuss, comment, correct or share our news and blog entries using the Disqus discussion plug-in we have added on the site. In our Aircraft module you are now able to make use of a wide range of new search options to get access to our extensive fleet list and aircraft database with over 35.000 aircraft currently being tracked. Additional information is available in Aircraft Data profiles including operator statistics and a variety of smart drilldown options. 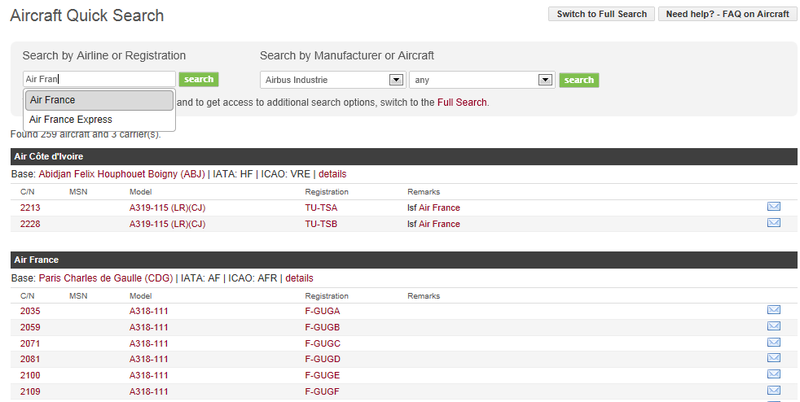 You still can enjoy access to the most up to date Airline database tracking the status of over 6.000 airlines. We now give you immediate access to an airline’s route network, subsidiary, parent, alliance and regional partnership information as well as direct links to background information allowing you to do further research on the site yourself. We have also built up a database of over 5.500 of the most relevant Airports worldwide. Each of the airport profiles includes geographical information and maps, access to the timetable and airlines based there or serving the airport. Statistics are also available with drilldowns to additional details such as the aircraft currently stored at a specific location. In cooperation with Innovata LLC we are now able to offer you complete access to Routes and Schedules of the vast majority of the scheduled airlines in our database with extensive search and filter options and drilldowns from and to all of the other modules available on the all new ch-aviation. With the relaunch and repositioning of the site and the move of some of our team members to full time ch-aviation editors, we have also revised our approach to how we share information on the site and now offer three different access levels. We will continue to make certain limited information free of charge and offer two subscription types, ch-aviation plus and ch-aviation pro, specifically designed to meet the needs of both airline industry professionals and aviation enthusiasts. We would like to invite all of you that have been subscribing to our newsletter for years to get an exclusive view of the full functionality of the new ch-aviation and have made available a 14 day trial offer that you can find here (where you can also review the plus and pro subscription benefits in more detail). Start exploring and let us know what you think. We would like to incorporate your feedback in our plans and also look forward to providing you with further new surprises over the next coming months. On behalf of all of us at ch-aviation, welcome aboard!